MB8600 is a DOCSIS 3.1 Cable Modem certified by Comcast XFINITY, Comcast Business,and Cox Communications. Owning your own modem typically saves $132 per year in cable modem rental charges. MB8600 supports ultra fast DOCSIS 3.1, the only cable modem standard that can deliver Internet speeds of 1Gbps or higher, up to many gigabits per second. Actual speeds depend on your cable modem service and the speed of your Ethernet LAN ports. MB8600 also has 32x8 support for the fastest possible speeds using the DOCSIS 3.0 standard. Even if you don’t have DOCSIS 3.1 service now, you can benefit from the 32x8 DOCSIS 3.0 capability that’s also built into this cable modem. MB8600 provides high-speed Internet for a computer, router, HDTV, game station, or streaming media device. To give simultaneous Internet access to many devices, plug in any router you like. MB8600 features low latency, for the fast response needed for many interactive games. It includes 1 open Ethernet GigE LAN port. There are 3 additional Ethernet GigE LAN ports masked behind a label. Current firmware supports bonding on 2 Ethernet ports, which is essential for delivering speeds over 1Gbps. Top actual speed is just under 1Gbps without bonding, just under 2Gbps with 2 bonded ports. In order to have port bonding increase your modem’s speed to just under 2Gbps or more, your router needs to support port bonding. It includes DOCSIS 3.1 Active Queue Management (AQM) which speeds page loads, gaming, and video conferencing. DOCSIS 3.1, 3.0, 2.0, and 1.1 support and Cable Labs certification ensure compatibility with services nationwide. Setup is fast and easy with our Quick Start guide. Our experienced USA-based support specialists are ready to help. 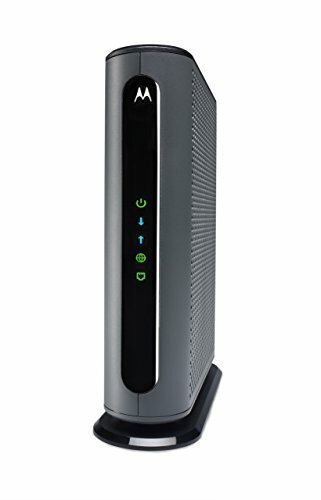 With Motorola extras including advanced surge and lightning protection, and a 2-year warranty, MB8600 is a superb choice for customers who want the ultimate in cable modem performance. MB8600 does not include a WiFi Router or VoIP telephone adapter. One open and 3 masked 10/100/1000 Gigabit Ethernet ports allow connection of any SINGLE device with an Ethernet port including a router, Windows/Mac computer, HDTV, game station. The multiple Ethernet ports are NOT for connecting multiple devices; they allow connection to a router that can bond more than one Ethernet port to achieve speeds over 1Gbps when supported by your cable service. Supports IPv4/IPv6. Includes Broadcom full-band capture digital tuner to enhance speed and save energy. Active Queue Management (AQM) significantly reduces Internet latency, much better than popular 32x8 3.0-only cable modems. AQM results in faster page loads for all Web traffic and greatly enhances interactive applications like online gaming and video conferencing. Attractive, compact design minimizes shelf space, improves cooling, and extends product life while looking great in any home or office. A two-year warranty plus rugged lightning and power surge circuits protect your investment. Includes phone and web support by friendly, professional USA-based technical support specialists.